Today is a Joyful Day! 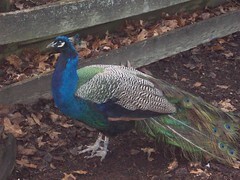 I loved watching this peacock wandering around the zoo yesterday, it reminded me of a park we frequented in Austin that had peacocks and peahens wandering around in it. We had some wonderful times there. Today was a lovely day. It started with sleeping in a bit and some chocolate chip pecan pie for my breakfast. (The girls had healthy breakfasts) How can a day that starts with chocolate chip pecan pie be anything other than amazing? BG, MG, and I were baptized this morning, which was a truly amazing experience. My heart felt so warm, and I felt such joy! The girls described it very similarly. LG is not old enough to be baptized (you need to be 8 ), but she watched happily. One of my step-brothers came to the baptism, as did my dear friend Nanny Ogg and some new friends from our church family. It was an experience I can’t describe well, because it was just so awesome. My step-brother came back to visit with us at the house for a few minutes (and did some guy work of removing some proof that our cat is a huntress). After he left we had some lunch & desserts, and then Nanny Ogg arrived and agreed to eat some dessert. Then, of course, we went geocaching! We found 3 caches, and also found a path that led to another 3 caches, but figured 11 minutes until sunset wasn’t enough sunlight to to walk a half-mile and search for caches. We saved that path for next time. We figured that finding the cache from the place we were kicked out of last time was good enough. LG spent all day asking to go to the grocery store and get chips, so after our geocaching, we went to the store to buy the 4 major food groups – soda, potato chips, bananas, and hot dogs. Those supplement the full pantry and freezer. Eggs would’ve been a smart idea too, but since we have the van!, we can get more Monday. Finishing the day with some turkey noodle soup (with nummy turkey stock) and some experimental cinnamon-craisin bread was perfect. And more chocolate chip pecan pie, of course! Today was a joyful day, and I am so grateful for the many blessings of family, friends, food, and our new church! May all of you have many days filled with joy!